The world has been abuzz about tariffs. What started as a relatively short list imposed by the US (primarily on steel and electronics) has since escalated into a 200 page document released by the United States last week specifically targeting China. China has promised retaliation. The history of tariffs in the United States is extensive, with economists still debating whether the Smoot-Hawley Tariff Act led to the Great Depression. Tariffs are designed to shift demand towards domestic producers and away from foreign ones. What does this mean for the international payments industry? Should they prepare for less business, or is it time to get creative about where new opportunities lie? Trump’s 200 page list is vast, with tariffs being placed on over 1,300 Chinese products, ranging from yarn to frog legs. The electronics industry, farming and agricultural industries are especially targeted in this most recent list. (We will have more on these Chinese specific tariffs and China’s tariffs placed on US business in another letter). Trump’s initial tariffs on steel and aluminum in March are a good indicator as to how tariffs may impact international payments. Trump’s recent tariff list is targeted at China, but his initial tariffs extended far beyond China. Below, we have taken a look at one industry being impacted by tariffs – the steel industry. Based on the chart above, it seems that Canada will be the hardest hit by steel tariffs. This is somewhat reflected in the CAD-USD performance as of late, with the Canadian dollar in a slump despite rising oil prices. The knock-on effect of this is a reduction in the demand for CAD-USD international payments as US companies switch their sourcing to domestic suppliers and Canadian steel makers receivables decline. 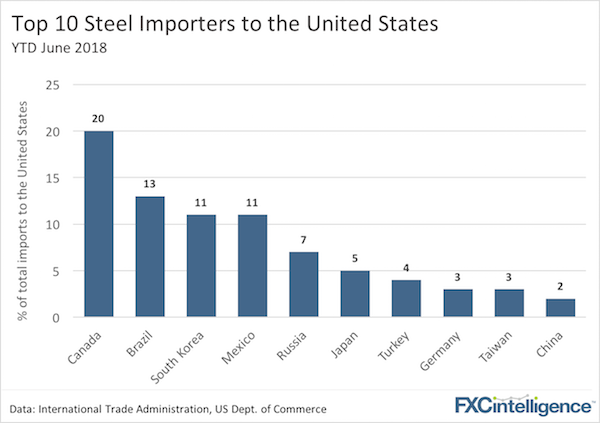 A final knock-on effect in this chain to consider is which sectors that have products made using US steel may now see increased exports to China – the ultimate goal of the current US tariff policy.